Inexplicably the Trinity find themselves on a rooftop in Gotham watching the fateful night that led to the death of Thomas and Martha Wayne. In the real world Lois is trying to get into the barn, mistaking the new lair of Poison Ivy for a sulking Jon's hiding place. When she spots Jon's beloved cap laying in the ground outside the barn Lois realizes that something is seriously wrong. Suddenly we are watching a young Bruce explaining the night's events and their ramifications to Dr. Quinzel. She suggests he be referred to a doctor that can help him conquer fears, but outside Batman snaps. This isn't what happened to him originally, this isn't their Earth or time he theorizes. Superman questions the revelation as his experiences were so real meeting his father Jonathan. Wonder Woman thinks there is a bigger purpose than to reunite with lost loved ones and they decide to head to Wayne Tower. Having agreed to the specialist, a grieving young Bruce is met by Dr. Crane, but with his toxins he appears to the boy as the Scarecrow on horseback, forcing him out of the penthouse suite window to his death. The toxins show him two demonic bats trying to attack him in midair but in actuality they are Superman and Batman mounting a rescue. When a terrified young Bruce hits the ground he finds a half bull, half human monster threatening to bind him but it's really Diana and her lasso. The magic of the lasso wakes Bruce from the trance and he finds Alfred helping him off the ground. Batman explains to Clark and Diana what happened to him and how he could never forgive himself for what happened to his parents. How his decisions led to Tim Drake's death. Superman and Wonder Woman disagree and support their friend in his grief. Meanwhile Lois smashes into the barn in the Smith pick up truck and orders Ivy to release her son. Story - 4: Not as strong as issues #1 and #2 but a compelling read from start to finish nonetheless. Lois was the stand out character this issue and her scenes stole the story to be honest, mostly because after so long and so many retreads seeing Batman's origin again feels tired no matter how well written it is. The dramatic beats are well written and the story plays out in a more enigmatic fashion as opposed to the literal approach in "Smallville". Francis Manapul writes a thoroughly entertaining issue, just wish it wasn't centric to 'that' night. 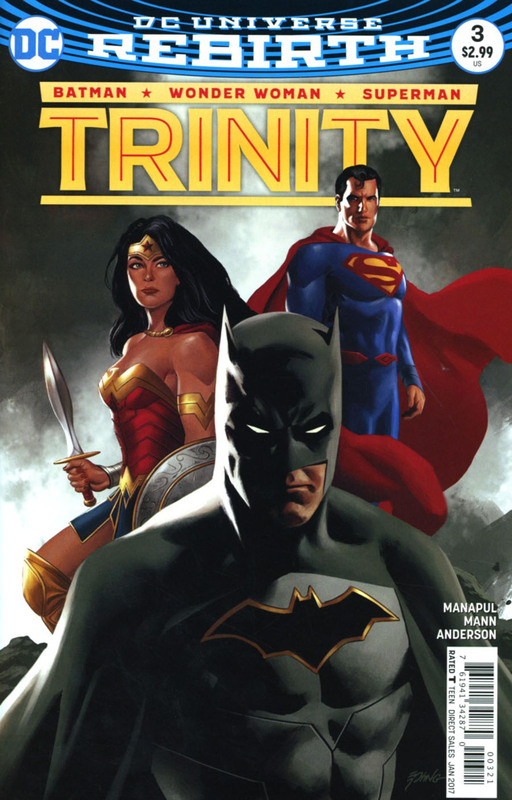 The blurb on DCComics.com tells us the plants Poison Ivy are using on the Trinity is a White Mercy, just fyi. 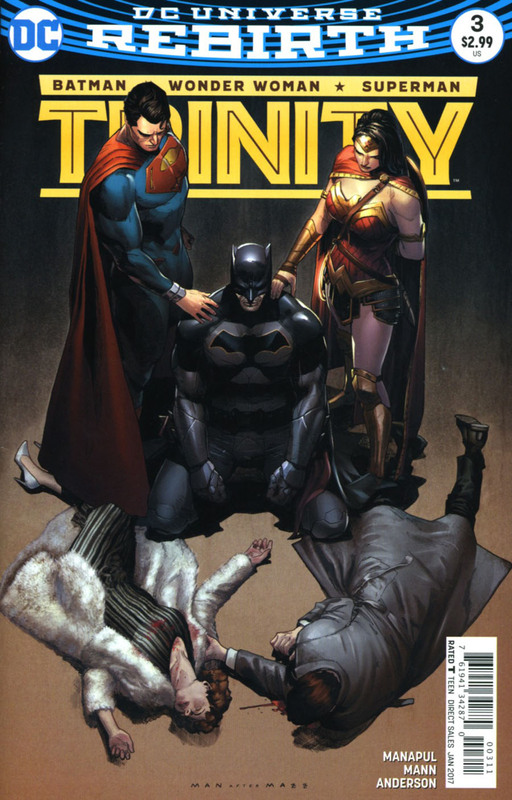 Art - 5: Clay Mann proves he is more than a match for the Trinity and to fill in when Manapul is unavailable. Notice how they look exactly like Henry Cavill, Gal Gadot and Ben Affleck? That's some skill right there. Normally I'd be irked by rotating artists but because the art looks this good I'm a happy bunny. Cover Art - 5: Diana enjoys a little focus over her male counterparts and this cover gives us a stunning looking Diana but she doesn't overpower Clark or Bruce. The perspective throws me initially but the more you look at it, the more you like it. Variant Cover Art - 4: This bat-centric cover using the 'rotation' theme really gives you a really nice piece of art. I really like it but I think it would be nice to see all three on equal footing rather than a 'spotlight' theme.